New for this year only, your group can celebrate the signing of the Magna Carta by King John at Runnymede in 1215, with a great value French Brothers river boat cruise with historic commentary along the Thames from Runnymede with views of Windsor Castle with a combined visit to The Savill Garden. It was 800 years ago, in 1215 that the Magna Carta was signed by King John on the banks of the River Thames at Runnymede. Discover more about this historic event with a fascinating commentary as you enjoy your river trip. The experience includes entrance to The Savill Garden, a return boat trip along the River Thames, lunch, cream tea and free coach parking at both sites. Also new for this year is the option to upgrade your river experience and travel by Victorian steam boat. Prices for the river boat cruise are from £28.50 per person. Groups can enjoy a number of unique catering options at The Savill Garden. The Gardeners Lunch with Savill Garden entry provides a luxury lunch buffet in a private marquee where your group will be joined by a gardener from The Savill Garden who will be able to answer all of your horticultural questions and includes a free guidebook; and a private Afternoon Tea Party with Garden entry and a full afternoon tea served on fine bone china and a glass of sparkling house wine. A landscape contemporary to the Magna Carta, Windsor Great Park was once part of a vast Norman hunting forest and you can still see a scattering of ancient oaks which would have been living at the time of the Magna Carta. Returning to this anniversary, your group can also enjoy the spirit of this historic area, with the wonderful Magna Carta Lunch package which includes entry to The Savill Garden and a free guidebook. This is your chance to be taken back in time to eat food from medieval England including poached salmon, veal and ham pie and a selection of English cheeses with celery, chutney and fruits with freshly baked bread served with mead. The Magna Carta Lunch is £24.50 per person and is available from April to September and served from 1pm. All group catering options are served by the restaurant team, winners of Best Group Catering Facilities as voted by the readers of Group Travel Organiser Magazine in the 2013 Group Travel Awards; and the team were also finalists in 2014. The Savill Garden is one of the country’s finest horticultural gems. With thirty-five acres of world class ornamental gardens, flowering woodland, and National Plant Collections, it provides beauty and interest throughout the year. The Garden was created by Sir Eric Savill in the 1930’s with the support of King George V and Queen Mary. Since then the Garden has continued to develop under royal patronage with HM The Queen opening the Rose Garden in 2010. This Garden, celebrating its 5th anniversary, provides an intense sensory experience with 2,500 roses specially chosen for their scent, strong colours and repeat flowering. As the deep aroma of the roses naturally rises, you can enjoy the perfume at its best, together with wonderful garden views, from a rising walk way. The Savill Garden also offers your group great value combined visits with Windsor Castle or Frogmore House. Combined tickets with Windsor Castle are available from April to October; and with Frogmore House from 28 July to 24 September. For booking details call The Royal Collection on 020 7766 7321. 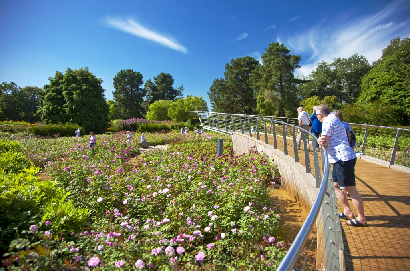 The 2015 group price for entry to The Savill Garden is being held at 2014 rates – (10+) per person £8 per person (March 2015 to February 2016). To find out more about the group offer call Helen Buckham, Group Bookings Co-ordinator on 0845 603 6228 or email: groups@theroyallandscape.co.uk.